William Makepeace Thackeray (1811-1863), famous for his novel Vanity Fair, wrote a number of Christmas books under the pseudonym Michael Angelo Titmarsh. 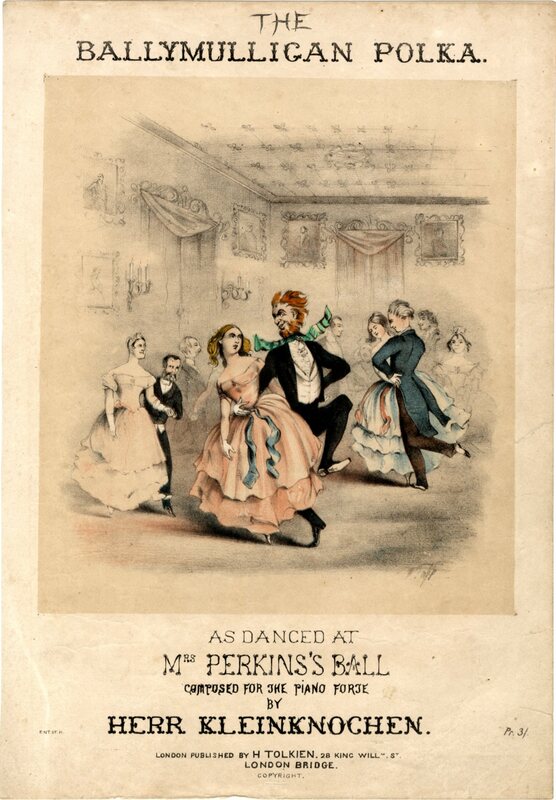 The first one to be published was Mrs Perkins’s Ball in 1847 and it achieved a great success. Thackeray himself drew the colorful illustrations for the short stories and one of these was used for the cover of this piece of contemporary sheet music, The Ballymulligan Polka. As Thackeray was fond of inventing new funny names, the name of the composer Herr Kleinknochen could well be a pseudonym invented by the author. Though a quadrille seems to me as dreary as a funeral, yet to look at a polka, I own, is pleasant. See! Brown and Emily Bustleton are whirling round as light as two pigeons over a dovecot; Tozer, with that wicked whisking little Jones, spins along as merrily as a May-day sweep; Miss Joy is the partner of the happy Fred Sparks; and even Miss Ranville is pleased, for the faultless Captain Grig is toe and heel with her. Beaumoris, with rather a nonchalant air, takes a turn with Miss Trotter, at which Lord Methuseleh’s wrinkled chops quiver uneasily. See! how the big Baron de Bobwitz spins lightly, and gravely, and gracefully round; and lo! the Frenchman staggering under the weight of Miss Bunion, who tramps and kicks like a young cart-horse. But the most awful sight which met my view in this dance was the unfortunate Miss Little, to whom fate had assigned the Mulligan as a partner. Like a pavid kid in the talons of an eagle, that young creature trembled in his huge Milesian grasp. Disdaining the recognized form of the dance, the Irish chieftain accommodated the music to the dance of his own green land, and performed a double shuffle jig, carrying Miss Little along with him. Miss Ranville and her Captain shrank back amazed; Miss Trotter skirried out of his way into the protection of the astonished Lord Methuselah; Fred Sparks could hardly move for laughing; while, on the contrary, Miss Joy was quite in pain for poor Sophy Little. As Canaillard and the Poetess came up, The Mulligan, in the height of his enthusiasm, lunged out a kick which sent Miss Bunion howling; and concluded with a tremendous Hurroo! — a war-cry which caused every Saxon heart to shudder and quail. “Oh that the earth would open and kindly take me in!” I exclaimed mentally; and slunk off into the lower regions, where by this time half the company were at supper.